Have you been caught out by the ever increasing world of Clickbait, enticed in with titles like “You’ll Never Believe What The Parrot Did Next!” in your Social Media feeds such as facebook. The main purpose of Clickbait is to get you to a site where adverts are displayed to get you to onward click and generate revenue for the sites owners. 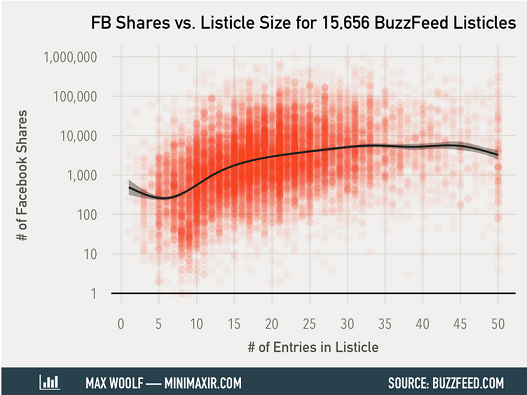 Max Woolf @ Minimaxir.com has recently mapped out 15,656 BuzzFeed Listicles which have been shared on Facebook. This has been achieved using R and ggplot based on a dataset from Buzzfeed. A copy of the code is also available on the authors Github repository.